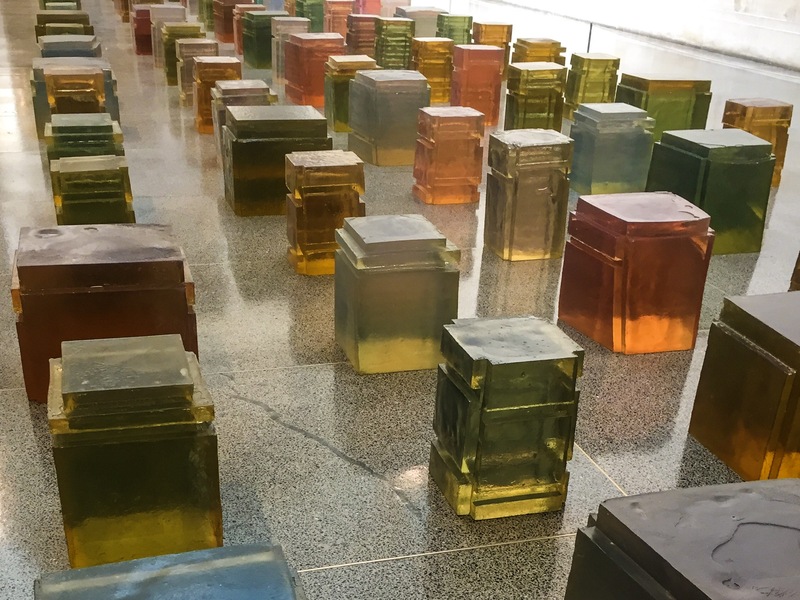 This post looks at the art of Rachel Whiteread, a contemporary British sculptor who creates objects and spaces using different materials such as resin, plaster, concrete, rubber and plastic. Her works range from small-scale moulds of everyday objects such as hot water bottles to gigantic life-sized houses. Tate Britain in London recently exhibited a retrospective of her sculptures. As part of the show, her installation ‘Untitled (one hundred spaces)’ (1995) was displayed in the main entrance hall of the gallery. In this post, I use this artwork as a thinking tool for considering how its materials, tools and processes could be used to produce a children’s creative learning environment. Rachel Whiteread created her installation ‘Untitled (one hundred spaces)’ from casting empty spaces underneath 100 different chairs. I have to admit that before seeing this artwork, I had never given much thought towards the hollow space under the furniture I was sitting on. Through focusing on negative space the artist draws attention to something that is usually not seen or observed. ‘Untitled (one hundred spaces)’make the invisible visible. As I walked around the artwork and looked closely at each individual structure, I felt like I was seeing hidden secrets that were there all along but I was only just realising them. I then started to think about what other spaces or things I had not been paying attention to. Like ideas, facts and feelings that I needed other people to point out before I could see and explore them myself. I also loved how each individual rectangular form in the installation has been created in a way that leaves traces of human feelings and memories. Looking closely at each rectangular form, I could see fingerprints and engravings in the semi-translucent resin. Each one had been individually moulded, bringing a unique memory of the individuals who had used it. The sculptures seemed to have personal relationships with unknown people. Not knowing who these people were given a feeling of a universal energy. Also, each individual rectangular form was arranged into a perfect grid in the gallery space. This made the installation feel like it was made up of individual people, each with their unique histories, positioned into a collective whole. Rachel Whiteread has developed unique moulding and casting processes to create her sculptures. This experimentation with materials, tools and concepts is interconnected with intellectual, conceptual, emotional, social and aesthetic experimentation. All of these processes grow together and through one another. The concepts of negative and positive space, as well as other concepts contained in the artwork, have the ability to open up divergent thought processes in people. Likewise, the material of resin and technique of casting also have the possibility to encourage unique ways of thinking and learning. Tate has created a video that shares insights on Rachel Whiteread’s process of casting here. I have selected two key points from ‘Untitled (one hundred spaces)’ to think about how these materials, processes and tools could be used to produce a children’s creative learning environment. These are space and clay. I have selected clay as opposed to resin as the latter is a difficult and possibly dangerous material to use with the little-ies. Children’s creative learning with materials through the sculptures of Rachel Whiteread. What types of materials could be used by young children to encourage exploration of ‘space?’ Ideas: Clay as a core material. Additional moulding materials that could be added in while children are experimenting (these could be any malleable material) – wax, plasticine, play dough. papier-mache or sculpey. Older children could try experimentation with epoxy resin. What other concepts relating to space and clay may children explore? Ideas: negative space, positive space, moulding, constructing, destroying, sculpting, forming, empty, full, size, height, width, depth, small, large, liquid, solid, open shape, closed shape, shaping, visible or invisible. These concepts may be introduced to children through an open-ended question while they are experimenting with a material. For example, how could we make the clay change form from solid to liquid? What art tools and equipment could support this experimentation? Ideas: using the body (especially hands) as a tool for sculpting clay. Other tools may include clay cutters, soft wire, sticks, plastic containers to moulded shapes – you could even make your own moulds using Pinkysil Silicone! What artistic techniques could be introduced to extend experimentation with the clay and space? Ideas: modelling, squeezing, stacking, carving, assembling and casting. I feel like I am all out of creativity today so please add your ideas and thoughts below!